No broken bones, no major screw-ups, and I didn’t poop myself even a little, even once. So, it was a better-than-average day of running. I don’t mean to suggest it was anything close to a perfect day but it was one of my best. Despite temps in the 80s, plenty of humidity, full sun, 3 full-on trail humpings (falling all the way down), many stumbles, and veering off course enough to add at least a half mile to the run, things came together for me. My “A” goal was 9:15 but I’d have been happy to see anything under 9:30. My previous best was 9:47 back in December. I ended up running 8:43:06 (averaging 10:27/mile), which was good for 6th place overall of 129 starters. It was a 3-lap course and I even managed respectably close splits even with the added distance, which came at the front end of lap 3 (when I should have known the course better since I’d already run that part twice). In the lead-up to the race I had been building up my trail mileage base, which I’ll continue through the spring and summer as I get ready for the Cactus Rose 100. While I have been doing some faster running a couple of times a week, I think it is the increasing weekly totals and running more on trail that helped me in this race. 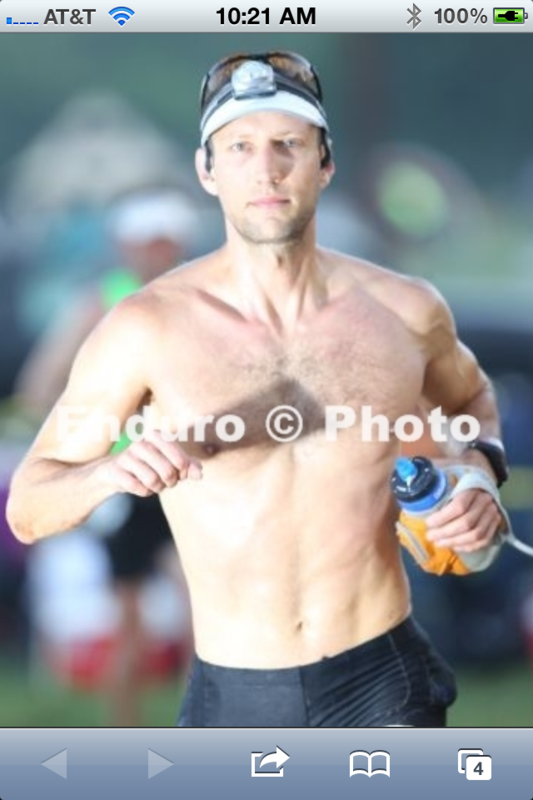 It ultimately came down to just slogging through the miles during the race, not letting myself walk much, that got me so far ahead in the field. It was really nice to still be passing folks 7 or 8 hours into the day – usually that has been when I really start fading and losing pace and position. Loop 1 was almost entirely in the dark. That, plus my enthusiasm to race well and my seeming love of superman falls resulted in my first dive of the day, probably less than 10 minutes into the race. It was the hardest of my falls but luckily only cut up my arm. 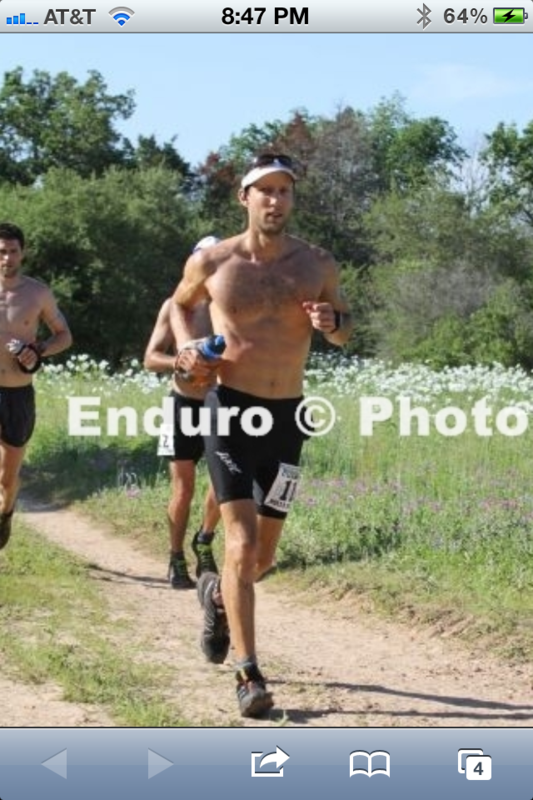 A cut arm doesn’t matter much for trail running. 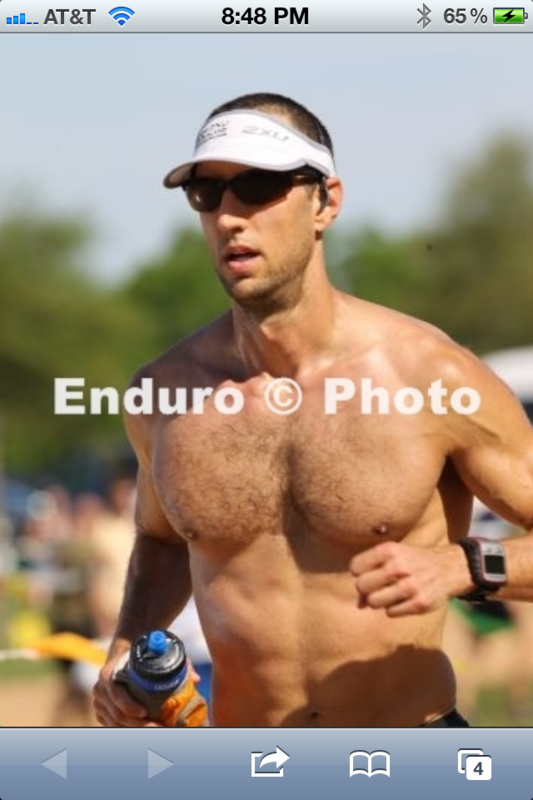 Actually, there were a few points in the race that I welcomed the sensation of sweat and sunscreen in my open elbow, as it really made it hard to think or worry about much else. The dark woods made footing tricky but I got through the first loop perhaps a bit too quick in 2:40. Loop 2 I spent leapfrogging the leading woman, Hiroko Suzuki, who had come in all the way from Japan specifically for this race. She was strong and steady and we were running close for a good 8-10 miles. After just a very little bit of chatting (she was there to race and I didn’t want her to waste energy speaking English), we took turns doing some of the work, essentially pacing one another. At about the halfway point of the race I was able to pull ahead and somehow held the lead to to the end, though Hiroko won the women’s divison by almost 30 minutes and broke the female course record. Loop 3 allowed pacers and that’s where I picked up Andres Capra. He was quite a good friend to make it out to the race just to pace me and he kept me steady and in relatively good spirits. I’d been running for over 5 and a half hours when he joined me and the heat was getting to me so I doubt I was a great running companion. He did just what he needed to, telling lame jokes, reminding me to eat and drink, and letting me suffer how I needed to as long is I didn’t slow down. The last few miles of a race – just about any race – really drag on for me. I get stupid. By the last dozen miles my thigh was cramping, I’d get sorta dizzy when I’d slow down (“So don’t slow down” – Andres), my math skills dropped from 10th grade to 5th grade level, and every tree looked like it was mad at me about something. Coated in salt, sticky from gels, scraped up and oozing here and there, I found a final burst of energy in the final half mile and finished strong with something like a sprint. Even better, crossing the line I felt pretty good, knowing that with a little easing of the pace I could have gone further. Now, three days later, I feel not so good. The scraps are healing and I was able to walk with Story for 5K around the neighborhood so I know the muscles aren’t in too bad of shape. But, I think the combo of the effort, the heat, the minor dehydration, and a sniffly Sagan have me on the edge of sickliness. I almost took a picture of the substance(s)/object that came out of my throat this morning. My motivation for running isn’t totally gone but I don’t have a whole lot of enthusiasm for laundry and dishes, which indicates something wrong if you know me at all. Another solid day or two of rest should do it. Assuming that I recover enough over the next few days, I’m tentatively planning to pace a friend of two in the St. Louis Marathon (or perhaps just half if I can’t man up) this weekend.